Hello everyone, I am off to Sun Valley this weekend to meet with writer David Seidler and Dame Naomi James and her daughter Lois, to talk about the movie we are planning about Naomi’s solo sailing voyage around the world in the 53 foot yacht Express Crusader in 1978 at the age of 29. I developed this feature in the 1980’s as a vehicle for myself, until David Puttnam (Lord Puttnam) pointed out that trying to produce and star in the film, was an event unlikely to happen. He was right, my name was not big enough, on which to raise finance and I opted be Producer instead, while we tried to recruit a major name. I am proud that I raised much of the Development money from New Zealand (Naomi’s homeland) and found the then relatively unknown talented writers David Seidler and his writing partner Jacqueline Feather. David went on to great things as we know, winning an Oscar for THE KINGS SPEECH and Jacqui has since retired from the film industry. But they had to endure economy flights to Ireland to meet Rob and Naomi, staying in very lowly B&B’s while they were there, for their research. 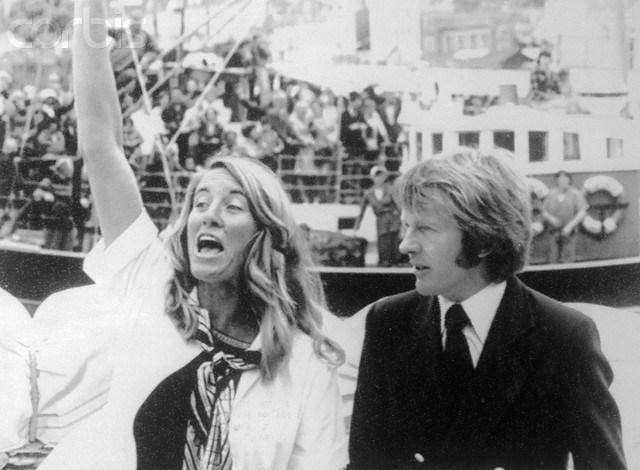 skipper, winning some of the big round the world races (the Whitbread) and he had been very much behind the film… Naomi had been a little more reluctant , being shell shocked by the media blitz and her subsequent Damehood. After the actual voyage. I think the idea of a quiet life with Rob, was appealing. So the project quietly died. I was sad, we had a wonderful story and a great script. Then earlier this year, I heard from Naomi again, would David and I like to have another go with the project? Her daughter Lois and husband Steve were keen, so here we are again friends about to embark on the great adventure and challenge of trying to get a big film made. 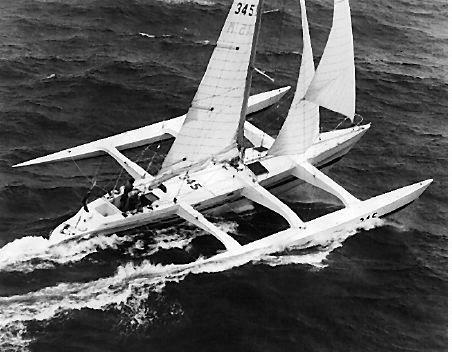 This will have to have substantial budget largely to accommodate filming at sea, never easy and the accompanying computer generated graphics to enhance the excitement of being in the huge waves of the Southern Ocean, the mast break, which Naomi managed to rig together again to complete the voyage among other events. But she has had to endure weeks without a radio, the failure of her rigging during gales in the Southern Ocean and her boat capsizing. It really is a thrilling and very moving story and of course she did the voyage in record breaking time, without the aids of modern technology, SAT NAV, GPS etc. So here we go again. Filming at sea has always been a huge challenge and had never been 100 percent successful. Robert Redford’s recent film ALL IS LOST works very well, but sadly I felt the story let us down as we never really knew what this lone sailor was doing out there and what his thoughts were. The story is all, as I keep bleating on about, we the audience have to CARE! So exciting times ahead, we have a wonderful story, a great screenplay and a myriad of excellent Directors who could make this. We are going to have an easier time because of the technology, although it’s very expensive and there are some terrific young actresses who could play Naomi and excellent young actors for Rob. Wish us well, This is a story worth telling. I will keep you posted. However referring to Robert Redford’s film as a success does not bode well; everyone who saw it who knows one end of a sailing boat from the other was disgusted, ‘ Hollywood BS ‘ absolutely rotten on important details ! What a fantastic project! Please get in touch with me Jane, I lived in Dartmouth in the 1970’s and may have some insights and photos of Naomi James you may find interesting. Sadly – Patricia…the project has come to nought….second time around…Hollywood politics! Thank you for the thought! I recently discovered this incredible story myself and I came across your entry here. I see from the comments and IMDB that the project has been abandoned. With such an incredible writer, passion and Dame James’ support on your side, I’m so curious what difficulties you encountered in bringing the story to screen. I would love to know this beautiful journey could be shared with a wider audience. Thanks for all the work you do to bring stories like this to life. The story of trying to get the film is long and complicated and bound up with the difficulties of our industry. I think it’s a wonderful story, but I think Dame Naomi has gone off the idea of a film, at least for now. Thanks for writing! Hi, I am the current owner of Express Crusader since January of this year. The yacht is now located in Holland. Please contact me if you think that would be useful. Thanks so much for getting in touch. Alas the project did not get off the ground….Hollywood politics, but I will keep your details in case things change… you never know in this industry!